with a water based technology. Our range of insulating gloves for electrical work is manufactured in France in a plant with ISO 9001:2015 certification. Control over the entire manufacturing operation guarantees very high quality standars. Unlike other industrial processes, our gloves are manufactured with a water based technology, without the use of solvents. Our technology, combined with the use of natural materials, provides assurance of greater concern for the environment. Our quality assurance laboratory is integrated into our production site and allows us to carry out all the tests according to applicable EN 60903 and IEC 60903 standards. The quality approach with the visual and dielectric inspection of 100% of the production offers users the guarantee of conformity. Our products are entirely made in France. Go round your hand with measuring tape, leaving out the thumb.  Close the hand without excessive clenching and take the measurement. Copy the measurements to the conversion table below.